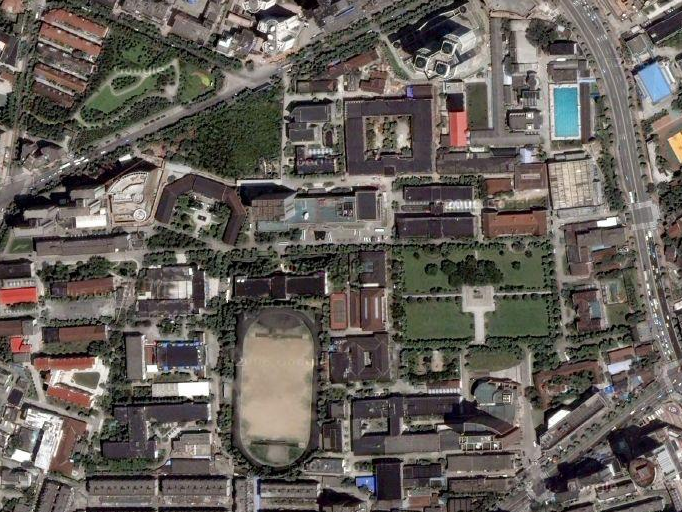 It is the satelite image of Shanghai Jiaotong University Xujiahui Campus. I stayed on this campus for two years. I also have the following pictures of the campus these days. Typically, unviersities are far from city. 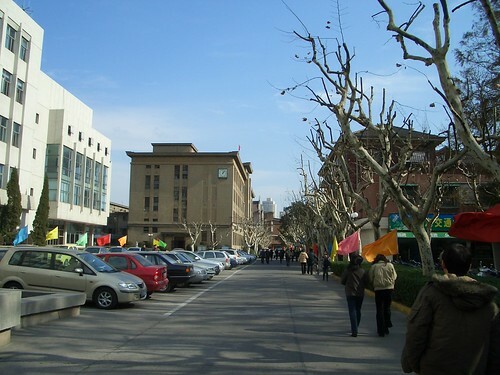 SJTU Xuhui Campus is an exception. It is in the downtown, and very close to the Xujiahui District Center. It can be easily accessed by Metro Line #1 Xujiahui Station (use Exit 13, the Pacific Department Store exit), and follow the Huashan Road for 5 minutes, then you are at the gate of the university. If you plan to visit a university in Shanghai, that is the place you should go. JTU, it’s kind of like UPenn, right in downtown. It was the school that I dreamed to enter when I was in high school, but didn’t. Now decades later, no regret, I don’t think my life would be a lot better if I did. I just found out that Kijiji was moved to JTU’s tech center building. Isn’t it great to work in the same place that you went to school? It’s a very making-sense move ’cause you are easier to recruit the best talents from the school. Best wishes for your success. As I understand you have to know Shanghai very well even concerning internet connections. I am sorry to reply in this cathegory but I need a little help, if you can. We have installed a sever in Shanghai with an adsl connection with China Telecom, but in these days something happened. The connection is very slowly we see the server from here (Italy) but it is impossible to ping any site. Could you tell me if in China there are some problems with the broad band or something elese? So gratefull for your kind reply. (The server is placed in Moganshan Road) Thank you very much!! I’m new in Shanghai and your blog is helping me a lot. I moved here with my husband from Italy. I’m a researcher in the field of social sciences and I’m searching for places like public libraries or university libraries where I can spend my time and study. Do you think I can find some in Shanghai ? SJTU has good library. You can get a library card there. Luzette, don’t worry. You are not the only one who found this problem. The Internet connection between China and Europe was cutoff because of Taiwan earthquake. It is expected to be prepared this month. So you still have to way for some days. Don’t worry. It is not your server. It is about the whole Internet connection in China. Thank you very very much. Your reply it was usefull and helpfull. Hope to see you sometime in the net, I will bookmark your nice blog!! Luzette, you are welcome. You question helped me to be aware that something everyone in China knows, like the Internet connection problem, may not be so common in other places. That is the reason I created this blog – to share some obvious things to people outside. Many thanks from me as well and keep posting interesting features, I’ll keep on reading you. Great post! I found you the other day while trying to find a bus that went between Hong Qiao and Pudong airports for someonand have really enjoyed reading your posts (except the dog story–too bad!) And now you’ve googled a pic from my old school I taught there for a year and was anble to show my family where the classroom building and my office was. Thanks! Hello! I found this blog yesterday looking for some information about studies in shanghai! This is a really great blog and I thank Jian and everyone for sahring their experiences! I’m a 25 colombian girl living in barcelone at the moment… I’m studying graphic design and finish my scolarship in july… I’m planning to go to shanghai for 6 months to study mandarin chinese… I’ve read mostly all the comments since 2004 and it really helps me to have an idea of what I’m going to find there… here is my question… I’m planning to go with my two little sisters and a friend of mine to shangai… we would be 4… and I think the best option is to rent an appartment for all of us together… what would be nessesary to rent an appartment in shanghai? I mean about bank papers or things like that… I’ve never been there and I’m so anxious about this trip! How much do you think we can pay for a two, three, or four bethroom appartment? We would like to live in a nice area with acces to night life, shops and of course a safe area… well, I appreciate if you help me with this information and will continue visiting your blog! thanks a lot!! Dear Jian Shuo Wang , have you got any news about connections? As we see there are still some problems!! Our server in Shanghai goes up and down just a little better then before but very very bad . There is still no update on the cable. China Telecom claimed it will be fully fixed by Jan 15 (today), and Netcom claimed it to be Jan 20. So what we can do is still wait. Thank you for your kind reply Wang! See you soon!! I’d like to improve my spoken english with any friend. as a return, i can teach he/she chinese or any other things if available. I am arriving in Shanghai on September 26th 2007 and staying 2 or 3 days before going to Zhuhai for business and language study. I speak very little Mandarin and none of the Shanghai dialect. I am looking for a guide to take me around Shanghai to see some of the city sites. Does anyone know a good guide service or a reliable individual that would want to do this? Chuck, you can check http://www.shanghailocalguide.com. Aron is great. I am planning to learn chinese in shanghai. 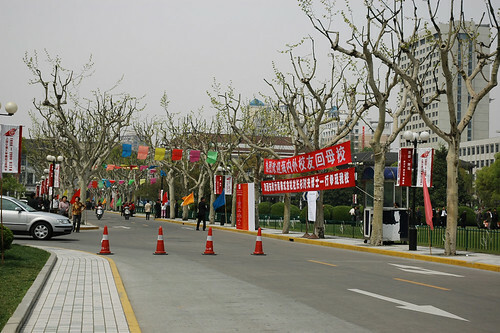 Do you have any list of apartments around jiaotong university?